This is a unique project: it’s not a true slide presentation, but a presentation demonstrating potential user navigation flow within a theoretical app. Because this is setup to be presented, we developed a 16×9 version of the app, used oversize icons and simplified much of the content so the audience has large, easy to track content. It was a presentation, but not a presentation of slides, but the content was revised to be the same size (aspect ratio) as slides… got it? Here is the final motion graphic styling, all developed using PowerPoint. Sometimes animation has become too easy. For example, during a recent project, it took longer for the animation request to be explained than to develop. Two slides, move logos, crop and let morph do everything for us with these social media landscape slides. Here is some more animation fun from another presentation project. The goal of this slide was to show national coverage (from the original 3 locations). The talking points were not specific to the locations, but on the positive corporate office growth. We knew there was time for a subtle animation of the map pin locations that filled some of the talk. The animation pane shows every line of text and every map marker, which were set in a 9 second animation. Often we create our own charts, not from the charting engine, but from shapes, text, and graphics. Of course, this is for highly visual presentations that we know are not going to rely on charts with data and can be adjusted for use in other presentations. So, this is as much about animation as slide content styling. 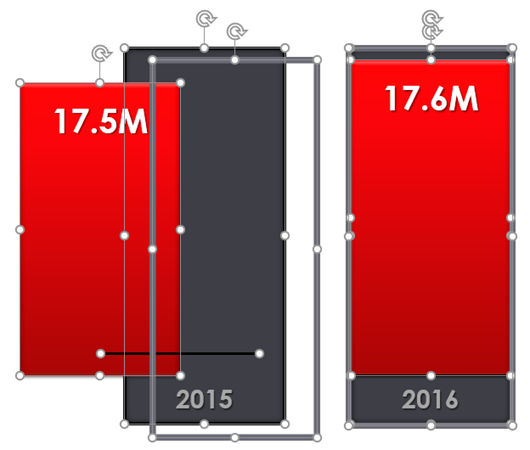 Before the animation example, I want to show the design for the nice bar chart. Each bar is comprised of 4 graphic elements: red box with text top aligned, grey box with text bottom aligned, grey outline (no fill box), and a black line. Here are the animated bar charts (sample video has 2 slides with visual bar charts, client content removed, and for example here only). Using the same slides as the previous Morph transition, this version of the Carousel Motion Effect uses big bold photos, and includes a nice PowerPoint reflection styling. 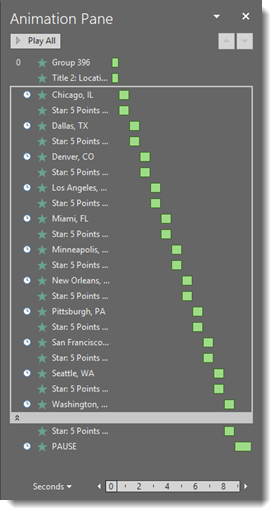 The animation in the video was completed on 7 slides, with no animation pane “animation.” Also included in the animation effect was the progress bar – equally easy to setup and animate with Morph. Using the Morph transition and 3D models this “Carousel Effect” is quick and easy to create. The animation in the video was completed on 6 slides, with no animation pane “animation.” Note: Each car not only moves and resizes, but also rotates from a 3/4 front left view to a 3/4 front right view as it moves across the screen. All animation was as simple as re-positioning the images, adjusting the rotation of the 3D models and applying a Morph transition. The Presentation Podcast Episode #54 Released Today! A new episode of The Presentation Podcast with Troy, Nolan, and Sandy is available today! 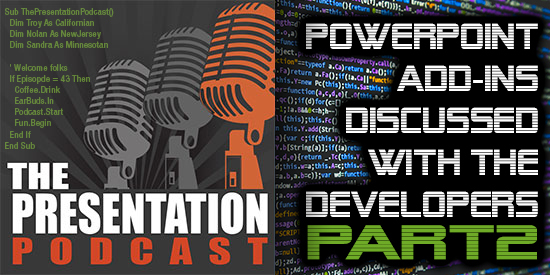 Check out the latest episode, #54 – A Conversation with PPT Add-in Developers (Part 2). PowerPoint animations often depend on which motion effect is needed. For this membership animation example, the request was to emphasis each segment of the pie chart for discussion points (again, we simplified the slide for the blog by removing client information, template and styling). Because the numbers are constantly updating, our goal was to animate the editable pie chart vs. creating custom shapes and animating. The formatting was simple, adjust pie chart and callout text size/position. For this effect, the Morph transition really did not accomplish a clean modern motion effect. A series of Fade transitions was a bit nicer than the Morph transition, but it still did not achieve a visual we liked. Ultimately, using the Shape (circle) out transition achieved a visual effect we liked. This is a membership animation slide from a recent project that demonstrates how to use animation to aid the presenter (we removed the nice template and styling). The message for the audience was that a very niche and exclusive association had exceeded all membership goals for the year. Rather than putting up a list of stats, we helped the presenter walk the audience through their 5 year story at their own pace with on-click animations and reveal the year-to-date total. The animation could be accomplished many ways, but the easiest way was to leverage Morph by splitting the original content across 7 slides, each slide transition being an animation. 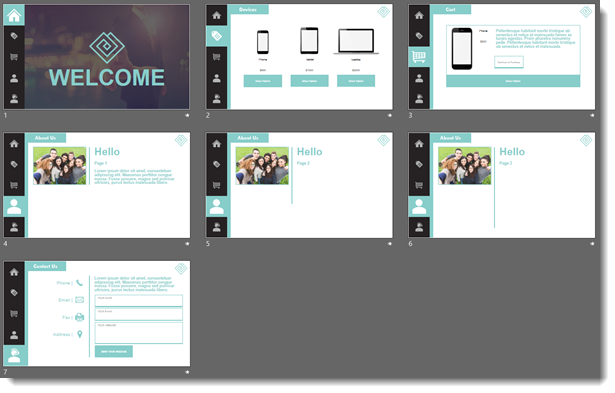 Easy to create, easy to manage, easy for the presenter to see the story flow. The presenter title slide is a perfect opportunity to add some motion and pizzazz to a presentation. This is one of the title slide looks for a recent project, which was all developed in Keynote.